Skiing is not always easy, but it’s a rare opportunity to experience the mountains and all of their grandeur. There’s the gear, there’s the perfect layering balance to stay warm but still be comfortable, and there’s the logistics of getting yourself (and potentially your family) where you all need to go. It doesn’t have to be too complicated though; together we can make it a trip to remember. 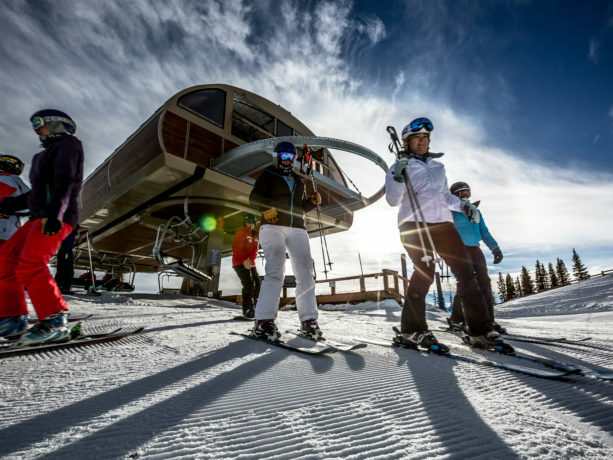 A ski trip is definitely worth it for the experience and memories and Women’s Ski Week is one of those weeks that should be on your radar for those reasons. 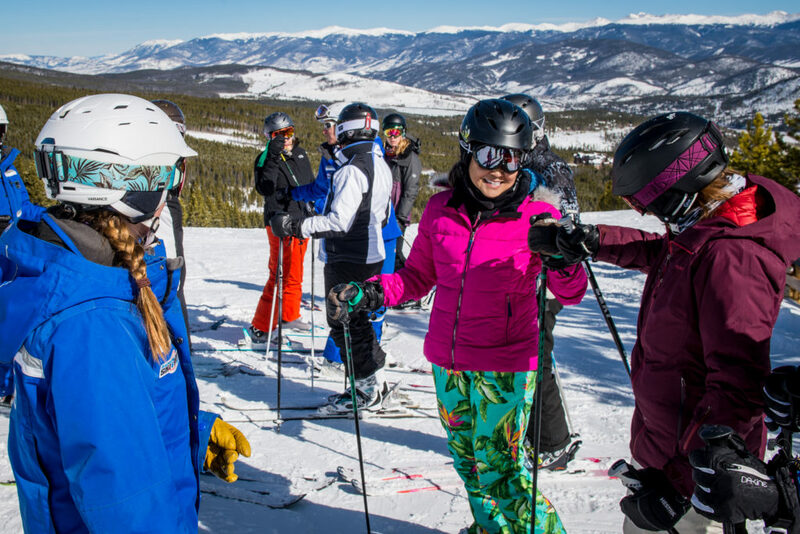 Women’s Ski Week (usually in February at Breckenridge Ski Resort) is a perfect week for a family, girl’s trip or solo adventure. Let me explain why below and what benefits you’ll get out of this particular week. Female skier from Breck’s Women’s Camp. You know you need new equipment, but you have no idea where to start – what to buy – what’s good – what’s not – and you hardly have the time to do the research. The best part about a free demo ski day is just walking up, answering a couple of questions regarding what trails you like to ski on and an expert will pick out a pair of skis for you to try out. They’ll size the skis properly to your ski boots right then and there and off you go! No need to even stop into a ski shop, just the tent outside on the snow. Try the ski out for the day or go back and try another one. It’s easy and quick – I love this day during the week. Multiple free yoga classes are held during Women’s Ski Week for women, instructed by women. Helly Hansen helps present these free yoga classes and they even hand out some wonderful base layers to participants of each class. The free hour yoga sessions are held in the elegant One Ski Hill Place hotel (snow-level) at the base of Peak 8 from 10-11 a.m. You can take some ski turns before and after the class or just take your time and enjoy the hour session without too many other plans. Ahhh – I feel relaxed already. It’s another great value and all for free. The best part of Women’s Ski Week for me was the lessons and all of the perks that came with them. Taking a ski lesson was the best thing I have done for myself in awhile! I wanted to have more fun skiing, improve my technique and feel more confident – the three-day Women’s Camp helped me do just that and more. Having a female instructor and other female students encouraged me and helped me silence my insecurities while focusing on my skiing. Women’s Camp not only improves your ski technique over three full days, but also included a Welcome Reception, gourmet breakfast, exceptional swag bag, three days of lunches, snack/hot chocolate/coffee breaks, happy hours, small awards, boot talk, ski talk, lots of laughs, new friends, and First Tracks before the lifts opened to the public. 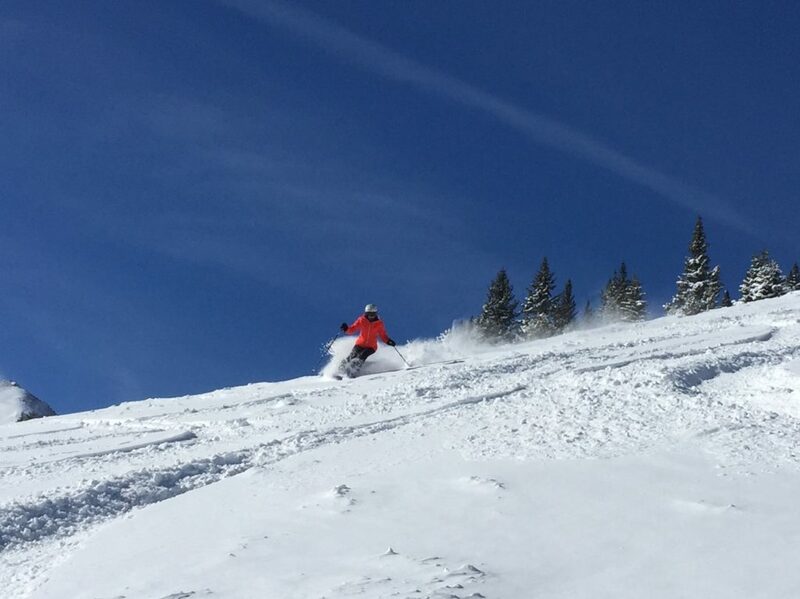 The two days of First Tracks were powder days – I felt like a VIP! Women’s Ultimate 4 Lessons are available throughout the week which means a maximum of four students in each lesson and is only a few hours long, so you don’t have to commit to a full day. The Women & Wine lesson offers a couple hours of lessons and then a complimentary wine happy hour in the luxurious One Ski Hill Place hotel. All lessons have access to the Ski School Lift Lines at each chair too. 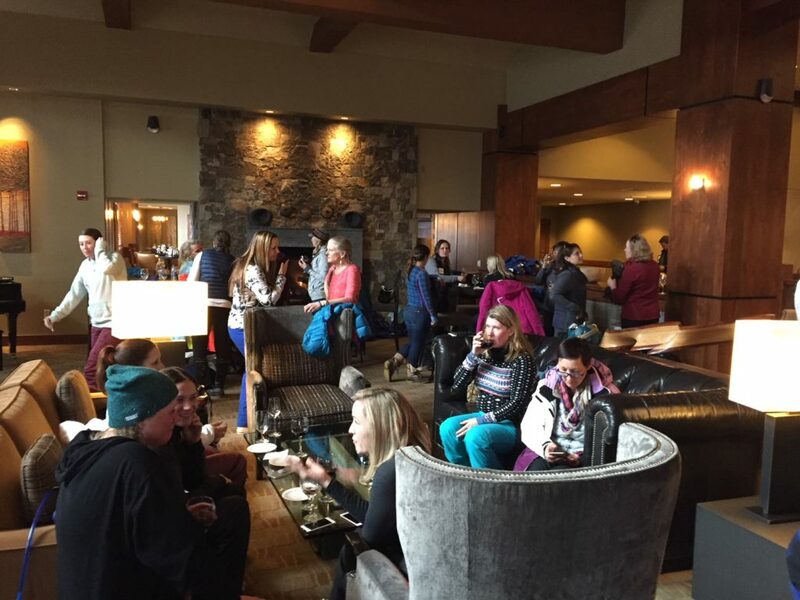 Women & Wine Happy Hour in One Ski Hill Place. Speaking of One Ski Hill Place hotel, you can find wonderful spa specials during the month of February. A Cranberry Sugar Scrub, added foot massages, and a glass of champagne somehow feels even better (and tastes better) at 10,000 feet elevation. Lodging deals can be found all over the town of Breckenridge – just take a peak on the deals page at www.breckenridge.com/deals. Happy Hour events and specials are plentiful, especially because Women’s Ski Week hosts special après events this particular week including a Wednesday Women & Wine (complimentary wine with certain lessons), Ladies and Lagers afternoon at 9600 Kitchen (open to all 21+ and tickets can be purchased here), and a special female-DJ hosted event at Park Avenue Pub with appetizer and drink specials to end out the week. The day that kicks-off Women’s Ski Week is the Get the Girls Out Ski Day presented by She Jumps. Women get together Sunday morning to begin the week on the hill (costumes are encouraged, but you can wear whatever you like.) The group skis together throughout the day and there’s a sponsored happy hour at TBar that afternoon. Lift tickets are discounted (almost half-off a window priced ticket!) and it’s the perfect opportunity to meet other ladies that you can ski with. Families are welcome – it’s not just for women – so get everyone out on that Sunday morning and make some new friends. You must register ahead of time here before all of the spots fill up. She Jumps Get the Girls Out Ski Day at Breckenridge. Just because it’s Women’s’ Ski Week, doesn’t mean that others can’t come. If you’re in Breckenridge with your family, there are numerous events that everyone can come to and there are events that only take an hour or two (like the women’s only yoga and the lessons) so you won’t be gone for too long. If you are traveling solo, this week is great, because you’ll make new friends in just minutes of joining an event! This week offers a plethora of social opportunities, so you’ll be able to choose what you’d like to participate in. Want to make it a girls’ trip? You can do just that – check out the schedule together and decide what sounds fun to you and your gals. Sign-up together and you’ll have the basis for a great getaway. Skiing is a one-of-a-kind experience that provides an exhilarating sense of freedom. Skiing with friends makes it that much more wonderful. Everyone who is a part of Women’s Ski Week, whether they join for one event or all of them, are friendly and open to good times together. Many women return year after year, are excited to see each other and become friends with new faces too. 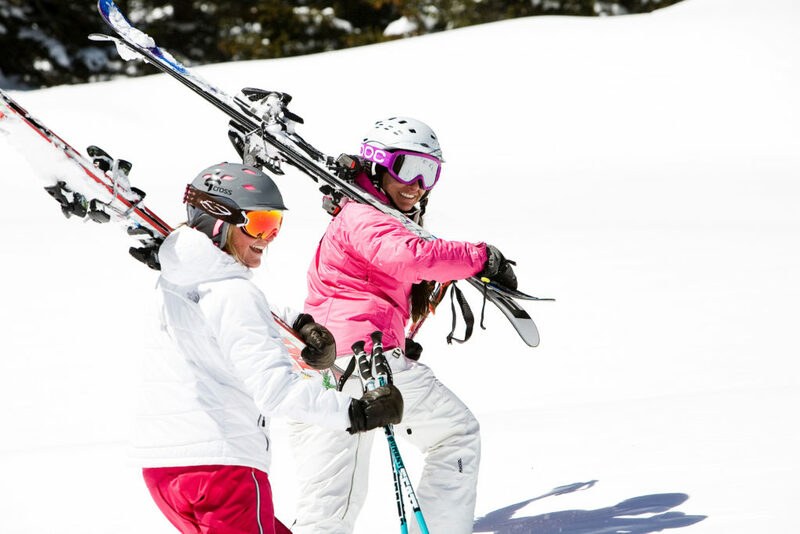 If you give Women’s Ski Week a try, it might even become your go-to week in the future. Group participating in Women’s Camp during Women’s Ski Week. If you have questions about Women’s Ski Week, visit www.womensskiweek.com, give Breck a call at (970) 453-5000 or leave your questions here. You’ll be glad you did!